Have you heard about the Great American Solar Eclipse or the 2017 total solar eclipse? The Great American Eclipse will occur on August 21, 2017. It will be the first total eclipse visible in the United States since 1979 — and the first one reaching from coast to coast in nearly a century! I’m going to share tips on how and where you can view this amazing and rare outer space weather phenomena. I’ve seen many lunar eclipses over the years, but never before have I witnessed a total solar eclipse. Neither have many of the millions of other people who have been waiting for years to watch this spectacular celestial event! Essentially everybody in the continental United States will see a partial eclipse on August 21, 2017. But only those within a certain area of the nation will enjoy the total solar eclipse. The 2017 solar eclipse will appear in totality over a swath of land approximately 60 miles wide — from Oregon to South Carolina. On either side of that relatively narrow path, there will be a partial eclipse. This eclipse will be unlike any other that currently living individuals will ever see again in the United States! But why is it called The Great American Eclipse? That’s because the U.S. is the only nation that will experience this particular eclipse event. It will begin in the middle of the Pacific Ocean, transit from Oregon to South Carolina, and end over the Atlantic Ocean. It’s also unusual in that it will be a coast-to-coast eclipse. It will be the first coast-to-coast United States solar eclipse since 1918 — when the moon shadow ran across the United States and the Bahamas. The 2017 total solar eclipse has been on many people’s radar screens for years now — since at least 1972! This 1972 New York Times story mentions the 2017 solar eclipse. It also profiles the advent of eclipse watch parties on cruises. It’s a really cool read for astronomy and tourism buffs alike! When was the last Great American Eclipse? The last time such an event occurred only over the mainland United States (just like in 2017) was on June 13, 1257 — back before the United States even existed! 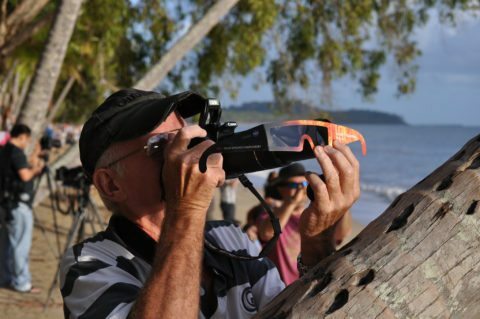 Thankfully, you won’t need to be on a cruise ship to see the 2017 total solar eclipse! So, who gets to see it? While the solar eclipse will appear in totality within the purple lines on the map above, the blue line shows the area of maximum umbral shadow — or the inner core of complete darkness. Southern Illinois is area of the United States that will experience the greatest duration of totality. The closest large city to the point of longest eclipse duration is near Carbondale, Illinois. Carbondale also holds the distinction of being where the next American eclipse will pass by in 2024. Madras, Oregon – Statistically, Madras has the best chance of good weather and great visibility for the solar eclipse. Snake River Valley, Idaho – This spot offers generally great weather, wide-open skies, and many roads for evading local cloud coverage. Casper, Wyoming – Looking for good weather prospects and major highways that take you north, south, east, and west? Head toward Casper — where the Astronomical League will be holding its annual conference right before the eclipse. Sandhill Region, Nebraska – This western Nebraska stretch offers good weather prospects and many major hotels. On clear nights, it’s very likely you’ll see the Milky Way! St. Joseph, Missouri – This large city boasts not only one of the longest durations of totality, but also one of the biggest eclipse watch parties anywhere in America. Heads up… Many astronomers will converge at the Rosecrans Memorial Airport! Hopkinsville, Kentucky – Local leaders call their town the point of greatest eclipse, citing a totality duration of 2 minutes, 41.2 seconds — just .4 seconds shorter than totality in near Carbondale. Nashville, Tennessee – This will be the largest city within the swath of totality. Those in Music City will experience nearly 2 minutes of totality — pretty cool! Great Smoky Mountains National Park, North Carolina – Want to see a solar eclipse with an incredible backdrop? Look no further than the Great Smoky Mountains National Park, where you might be able to see the moon’s shadow fall across the landscape before more than 1 minute of totality. Imagine that! Columbia, South Carolina – East Coast residents, take note: Columbia is probably the most convenient major city for viewing the 2017 solar eclipse and enjoying more than 2 minutes of totality — 2 minutes, 30 seconds, to be exact. Hotels and highway access are plentiful here, and there are sure to be many eclipse watch parties going down near the River City. 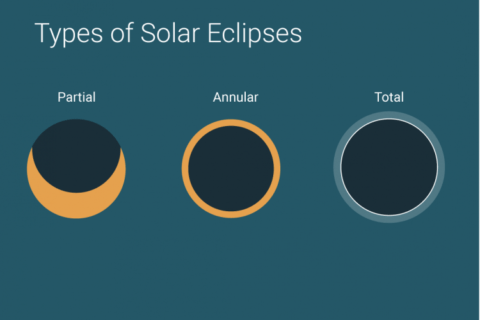 Is it dangerous to view a solar eclipse? Yes, it’s dangerous to view a partial eclipse — because much of the sun is still visible and can do very bad, permanent damage to your eyes. You must wear eclipse glasses! However, it is safe to view the sun only (and I repeat ONLY!) during totality of the solar eclipse. This is information I’ve fact checked with the American Academy of Ophthalmology. You won’t need a telescope or binoculars to view the 2017 total solar eclipse — definitely not! 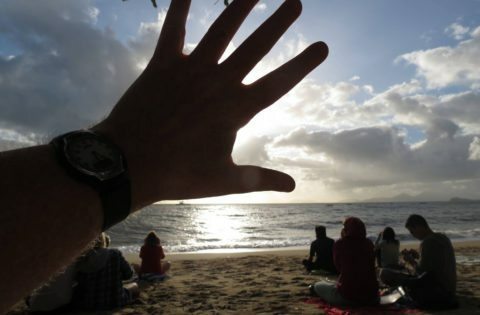 However, you should use special solar filters for viewing the sun. There are several types available for cameras and for viewing by eye. If you won’t be in a good viewing area on the day of the 2017 eclipse, you can still watch the eclipse live. NASA will be livestreaming the eclipse in its entirety from 100,000 feet above Earth’s surface! A solar eclipse occurs when the Moon passes between the Earth and the Sun. When this happens, the Moon partially or completely blocks the Sun from view — and it will cast a shadow across part of the Earth’s surface. During a midday solar eclipse, it could appear to be nightfall outside as the Moon eclipses the Sun. In a matter of minutes, things will turn from sunny daylight to dusk conditions. A lunar eclipse occurs when the Earth comes between the Moon and the Sun. During lunar eclipses, the Moon may appear darkish red — and in some cases, most of the Moon will be totally obscured from visibility. If you’ve never seen any kind of eclipse before, then the 2017 total solar eclipse will blow your mind! When Will The Next Total Solar Eclipse Be? You can get your total solar eclipse fix again in 2024. The 2024 solar eclipse will take place on April 8, 2024 and will have a longer duration — with a peak totality of 4 minutes, 28 seconds. It will be seen across much of the Central and Eastern United States. 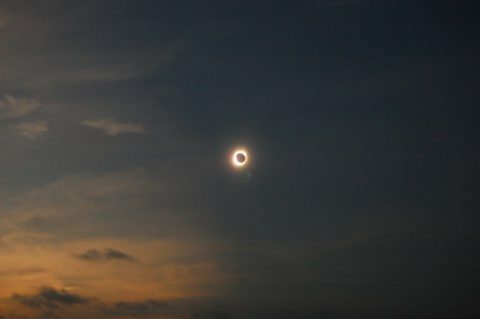 There will be several other total solar eclipses viewable in the United States during the 21st century. The next Great American Eclipse occurring only over American mainland soil will be in 2316 — on January 25, 2316, to be exact. How Long Will The 2017 Solar Eclipse Last?